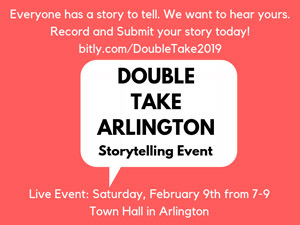 The Arlington Human Rights Commission is kicking off the year with our popular community building storytelling event: Double Take: Stories That Make You Think Twice From the Arlington Community. This year, we’re experimenting with people recording their stories on their own and submitting them to us. The AHRC Double Take Team will review all story submissions the week of January 28 and notify the selected storytellers who will be sharing their story at the community event at Town Hall on February 9th. We are open for submissions now until 1/25. Go to bitly.com/DoubleTake2019 to learn more. If you have any questions, concerns, technical difficulties at all, please let us know; email Commissioner Kristen Bauer at kbauer@arlingtonhumanrights.org.